The third Grand Prix of the 2019 Formula 1 season will pit last year’s champ Lewis Hamilton against his teammate Valtteri Bottas, who currently sits at the top of the season standings. All eyes will be locked on the Shanghai International Circuit on Sunday, April 14 at 2 p.m. (7 a.m. UK time) to watch the Chinese Grand Prix live online. This guide will cover all of the free and paid options F1 fans around the world can take advantage of to live stream the race. Note that most options are geo-blocked, meaning they can only be watched from certain countries. To get around these restrictions, we recommend using a VPN to route your internet connection through a server in another country. This will allow you to unblock free streams in Brazil and the US, among others. We recommend ExpressVPN. It’s fast, easy to use, and has a 30-day money-back guarantee. ExpressVPN will let you connect to the internet through a server in 94 different countries so you can watch exclusive content from anywhere. ExpressVPN is fast enough to live stream video and keeps you safe while doing so. BEST VPN FOR Grand Prix:ExpressVPN is our #1 Choice. A super fast and reliable choice that unblocks most major streaming services. Best-in-class security and privacy. Try it risk-free with the 30-day money back guarantee. 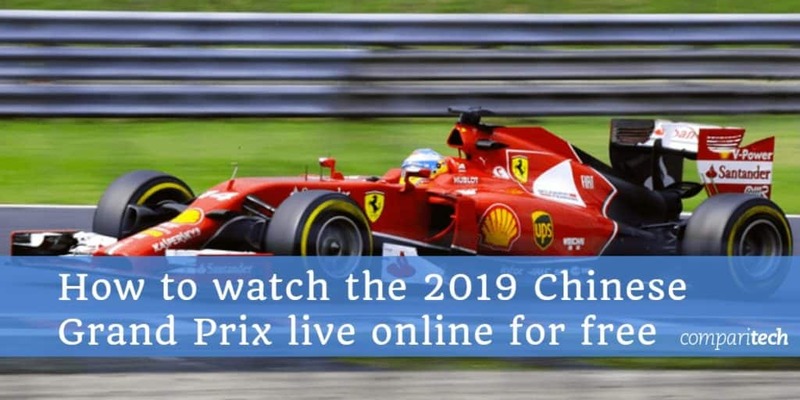 You can live stream the 2019 Chinese Grand Prix practice, qualifiers, and main event through a number of legal sources. Free options include Globoplay in Brazil and ESPN in the USA via an over-the-top internet TV service free trial. In the USA, ESPN has broadcasting rights for the full 2019 F1 Grand Prix season on various ESPN cable channels. You can use the WatchESPN app to stream the races, but you’ll need a cable subscription to log in. You will need an American IP address in order to watch any of the options listed above. If you live outside of the US but want to access streams from these services, use a VPN to connect to a server in the United States. For British users, Channel 4 will only broadcast highlights in the 2019 season—no live coverage like in 2018. Instead, Sky Sports F1 has exclusive rights to broadcast all F1 races in the UK for 2019. If you’re in the UK and have a cable subscription that includes Sky Sports F1, coverage of the Chinese Grand Prix can be found on the Sky Sports website or Sky Go app. If you have a cable subscription but are outside of the UK, then check out our tutorial for watching Sky Go abroad using a VPN or smart DNS. NOW TV offers a Sky Sports week-long pass and is available on a NOW TV Box, Chromecast, PS4, PS3, Xbox One, Xbox 360, Roku, LG Smart TV, PC or Mac, and selected mobile and tablet devices. Viewers in Canada can catch the race on TSN 3 or RDS 2 with a cable subscription. Online streaming via TSN 3 or RDS 2 is also possible but you’ll still need a subscription in order to access it. Remember you’ll need a Canadian IP address as well, which you can get by using a VPN if you’re abroad. Except for the Australian GP (which already happened), Fox Sports has exclusive rights to all 2019 F1 Grand Prix races. To watch online, you’ll need a Foxtel Digital Subscription, which costs AU$4.99 per month or $49.99 per year. If you already have a Foxtel cable subscription, you might be eligible for a complementary Digital Subscription. Note that subscribers outside of Australia will need a VPN to unblock live streams. F1 fans in France can watch the full F1 Grand Prix 2019 season with a Canal+ subscription and the myCanal app. The basic plan starts at €19.90 per month and a 1-month free trial is on offer, which means you can use the free trial to stream the Chinese Grand Prix for free if you haven’t taken advantage of it yet. Note that you’ll need a French IP address in order to access the stream, which you can get with a VPN if you’re not in France. F1 fans in Brazil can use Globoplay to watch the entire F1 2019 season online. Only Canada, US, and Mexico GPs won’t be live but will be replayed the following Sunday after each event. The good thing about Globoplay is that it’s free and accessible to anyone, even those outside of Brazil. All you need is a VPN and a free account to the site. All times are Shanghai local time (UTC+8). Qualifying begins on Saturday, April 13 at 2 p.m.
Practices start Friday at 10 a.m. and 2 p.m. and Saturday at 11 a.m.
Kodi user? No problem! We’ve got a separate article on how to watch the 2019 F1 Grand Prix full season with Kodi. As with non-Kodi streams, you’ll likely need a VPN to watch video from other countries.